General Information: Masjid & Islamic Center with A Sunday& Saturday weekend School currently Serving the Young Muslims. Activities for the Youth & Adults. Day & evening classes for Adults. A full time preschool & Kindergarden was open starting September 2000. Directions: From I-5 or 91 fwy: Exit on Brookhurst, go south for about 3 miles. The Masjid is on your right hand side. 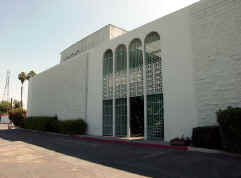 General Information: The Masjid is one of the most active centers in the Southen California area. Although relatively new, it has grown to become a beacon of light to the Muslims and non-Muslims too. The Masjid invites qualified speakers from all over the Muslims world to give Khutbas and lectures, and to help with the Ramadan program. Programs include Sunday school for our young Muslims, weekly Jum'aa Halaqa, weekly Fiqh class on Saturday given by a Sheikh from Al-Azhar University, special classes for the Sisters, distribution of Da'wa books, Arabic classes for non-Arabic speakers, and special events of informing the local community about issues of concern to Muslims all over the world. Directions: Located at 2 Truman in the City of Irvine. The major cross streets are Roosevelt and Jeffrey. General Information: The Islamic Center of Irvine is committed to provide Islamic services to Muslims in the greater Orange County area. We will actively propogate the message of Islam to eliminate misunderstandings among non-Muslims and to invite them to Islam. Create an atmosphere whereby our youths and others are proud to declare their faith. Directions: WE ARE LOCATED ON 1001 E.GRANT ST.#B2 SANTA ANA,THE MAIN CROSSING STREET IS STANDARD AVE. BETWEEN BISHOP ST. AND WAKEHAM ST. Directions: Intersection state-college st. and 91FREEWAY. The entrance of the masjid on state college st. (Masjid Omar Al-Farouk). General Information: Masjid & Insha ALLAH week-end school for the kids . Directions: From 60 West Bound, exit the Brea Canyon Road exit and make a left. Make a left on Brea Canyon Road. Go under the bridge and turn left into the Shea Business Center. From 60 East Bound, exit Brea Canyon Road and turn right. Turn left into the Shea Business Center. From 57 North, take 60 West. Exit Brea Canyon Road and make a right. Turn left into the Shea Business Center. General Information: We hold Salatul Jumu'ah every Friday at 1:00 pm. We have programs on Sunday for children, youth and adults from 10:00 am until 2:00 pm. We hold day and night classes daily for adults. We also conduct family counseling. Please call for more information. We have opportunities available. Use our contact form - http://icnasc.org/contact-us and let us know more about your business, and what you're interested in advertising.